It’s the International Soccer Championship and your country is in contention for the cup. You’re the team’s most valuable striker and you’ve been given one simple job: SCORE GOALS! Sixteen teams have qualified for the tournament and you will need to defeat each one of them in order to celebrate victory. France, U.S.A., Spain, Australia, Germany, Belgium, Sweden, Holland, England, Brazil, Switzerland, Finland, Italy, Canada, Mexico, and Japan are all in contention, with each team becoming increasingly difficult to beat as you advance through the tournament. So use your three flippers and the corner kickback to score goals as the commentator calls out the play-by-play in one of five languages: English, Italian, French, Spanish or German. As team striker, there are several shots that you’re being counted on to make: corner kicks, free kicks, throw-in shots, penalty kicks, and shootouts. But the opponent’s goalie, with his belly-mounted target, will be there to stop you with each attempt. 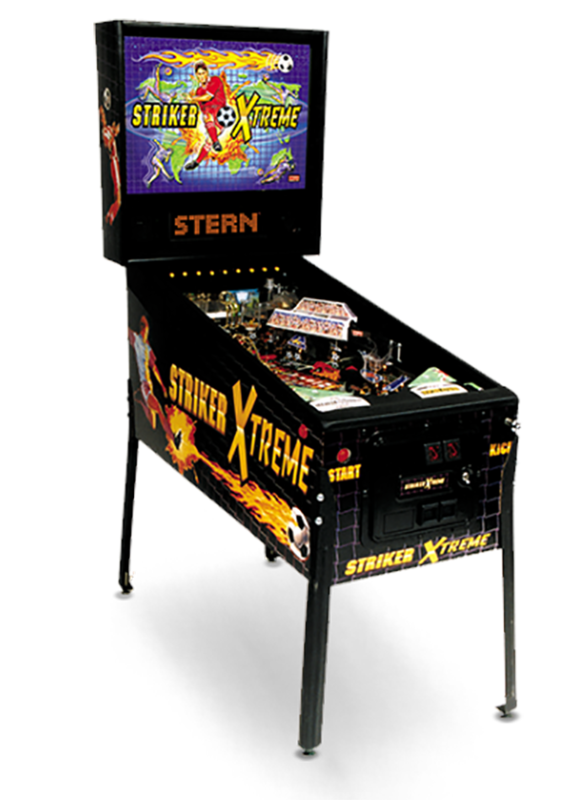 So as the competition grows more intense, so do your scoring chances in the Xtreme rounds and in both Stadium and Celebration Multi-Ball modes. Good luck striker…the team is counting on you! Time your plunge to collect one of the displayed awards. Spell CUP to advance Bonus X. Get past defenders and the goalie to collect current goal award (Big points, Beat Country, Xtreme Round). Complete 4 soccer ball targets to light side ramp and spot defender return lane for a penalty kick. Shoot the left hole to spell SHOOTOUT. Then shoot either ramp shot to collect shootout hurryup award and take a free shot on goal. Defeat flashing country when Beat Country is lit at goal. Complete groups to earn extra awards. Shoot the spinner to light locks. Shoot lit ramps to lock balls in Stadium. During multiball, all red arrows are lit for jackpots. Shoot the side ramp for super jackpot. Shooting a goal always defeats a country and relights all jackpots. KICK Defeating a country lights free kick on the outlanes (you get the ball back). Defeating the 2nd country in a group lights halftime. Making shots, soccer ball targets, and soccer ball combos awards soccer balls. Collecting soccer balls lights vendor for a mystery award. BALL Light extra ball by defeating countries, collecting soccer balls, vendor award, and…? 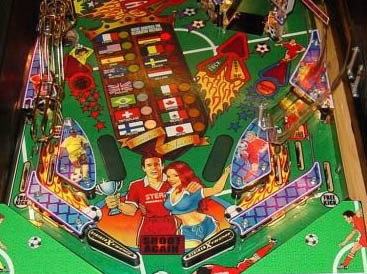 Defeat all countries to start celebration multiball. All shots are always lit for jackpots. Lock all balls for a chance at super shootout for huge points.